On the eve of the Chong Yang Festival, golden flowers fill the Imperial Palace. The Emperor (Chow Yun Fat) returns unexpectedly with his second son, Prince Jai (Jay Chou). His pretext is to celebrate the holiday with his family, but given the chilled relations between the Emperor and the ailing Empress (Gong Li), this seems disingenuous. Amid the glamour and grandeur of the festival, ugly secrets are revealed. As the Imperial Family continues its elaborate charade in a palatial setting, thousands of golden armored warriors charge the palace. Who is behind this brutal rebellion? Where do Prince Jai's loyalties lie? Between love and desire, is there a final winner? 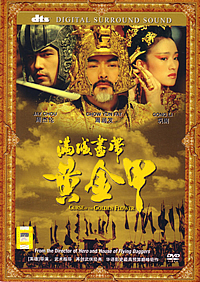 Despite it's $45 million production budget and a stellar cast including Superstar Chow Yun-Fat, Gong Li and popular pop star Jay Chou, "The Curse of the Golden Flower" is essentially a family, melodrama set in the flamboyant Tang dynasty. The structure of the story is plainly based on the widely known 1934 Cao Yu's play "Thunderstorm" which highlights a morally corrupted household. But Zhang is not going to make things easy it seems, after his wuxia epic directorial debut, "Hero" and "House of Flying Daggers", he's bent on setting this huge drama in the even larger Imperial palace. Beside elaborate sets, historically-accurate costumes & accessories, there's the tongue-wagging display of beautiful bosoms as well. However, with all the eye-catching elements, Chow (The Emperor) and Gong Li (The Empress) are the ones truly stand out in the end. Seeing these two veteran actors battling it out onscreen is a luxury. Mainland actor Liu Ye who plays the submissive Elder Prince is another gem to behold. Jay Chou unfortunately stands out among the crowd but in a bad way- he seems embarassingly out of place and unnatural. His only saving grace perhaps is his self-penned melancholic theme song, "Pavilion of Chrysanthemums". Renowned action director, Tony Ching also lends a hand in choreographing the major action sequences. Breath-taking but somehow lacks the vibes of his usual style. A contender for Achievement in Costume Design in the 79th Academy Awards, "The Curse of the Golden Flower" is yet another Zhang's ambitious project. Stripped off all the various display of eye-candy elements, "Curse" plods along like any of Zhang's previous works, "The Road Home" or "Lifetimes". Thought-provoking and absorbing. Pity that Zhang overlooks the fact that beautiful bosom isn't going to earn him additional credits. The 20 odd minutes "Secrets Within" documentary is the usual standard featurette that comprises of cast and crew interviews, costumes design and action choreography. Treat it as an prologue before you play the movie. The other 2 short featurettes includes individual interview segment with Chow Yun-Fat and Gong Li. The features found on this disc is a bit weak and in fact, all the featurettes can be found on the official "Curse of the Golden Flower" official website. Too bad, the Jay Chou's theme song music video is not included. Surprisingly, the disc comes with both Mandarin and Cantonese tracks. But since the dialogue is originally spoken in Mandarin, the Cantonese dubbing looks set to be the less popular choice. The DTS soundtrack gives much ambience and astounding sound effects during the battle sequences. In addition, the dialogue is very clear despite Chow's heavily accented mandarin. The disc transfer never disappoints or diminished Zhang Yimou's style of maximising his palette. Highly stylish and bright throughout, the shimmering gold and yellow is wonderfully transferred onscreen. It's so outstanding that it might just crack your flatscreen LCD.